The road to becoming an HGV driver can seem complex and daunting if you’re new to the industry. Or, as is often the case, you might have been given different information on what you need to do to obtain your licence. Here we’re seeking to make it as simple as we can for you to find out just what you need to do to get started behind the wheel, and join the 312,000 existing HGV drivers in the UK! First things first, there are a few things you’ll need to make sure you’ve got before you can start. You need to complete a D2 (completed by you) & D4 (completed by a doctor) form. Click here to order the forms direct from the DVSA. If you have an old-style paper licence you’ll need a passport photo too. You also need an HGV medical. Your GP will be able to do these, but will usually charge around £120. You can get them for about half that price by using a specialist company such as Cotswold Medicals (click here to go to their site). Bring your D4 form to your medical so the doctor can complete it for you. You won’t need to have this to do your training, but you’ll need it once you’ve passed if you’re looking to drive for work. You can get one of these by filling in a D777B form (click here to download or print). Once you have the medical out of the way and you’ve got your provisional licence back, you can begin your training! There are lots of companies out there that offer training. Whoever you choose to use, make sure you book direct with the company delivering the training, otherwise you’ll end up paying way over the odds. A quick online search should bring up some local companies if you’re based elsewhere. Expect to pay around £1,300 for a week’s intensive training, including the fee for the practical test. In contrast, if you book through an agent, this figure will rise to around £2,500 for exactly the same thing. Providers will often offer extras such as “pass insurance” which can be worth considering – this is usually around £300 but will vary depending on what it includes. Ask the company you are talking to if they deliver the training themselves. If not, they’ll be a booking agent. What is the company name? Booking agents usually keep to generic names such as “HGV Driver Training” or similar. Do they offer finance (“buy now pay later”) schemes? If so, the chances are they are a booking agent. Some training schools will offer finance but it’s unusual. Do they say they’ll “guarantee you a job” after your training? Most training schools stick to doing the training rather than finding people work. The amount of practical training that you need will vary depending on your experience and how quickly you learn, but typically people need 20-30 hours of instruction to get to test standard. This will normally take place over a 5-day period but it isn’t mandatory. The duration can vary between training providers and your availability. Your local training company will be able to give you advice and some may offer a short observation drive to estimate how many hours you’ll need. Do I Go Straight For My Test? You can start your practical training as soon as you have your provisional licence, but before you can take your practical test, you’ll need to have passed your theory test. You can click here to book your theory test. It’s worth doing some revision before taking your theory test – there are various books and apps available for this. Make sure you get the latest version so the information you get is up-to-date. If you want to be sure, go for ones that are certified as “official” and have been published within the last couple of years, as these materials can be updated quite regularly. You can also click here for a mock theory test which is free to use. The questions will be similar to, but not the same as, ones used in the actual test – so don’t bother copying them down! If you’re wanting to drive for “hire or reward” (i.e. for a job or to make a profit), the chances are you’ll need to complete your Driver Certificate of Professional Competence (Driver CPC). There are a few exceptions to this – click here for details of CPC exemptions. 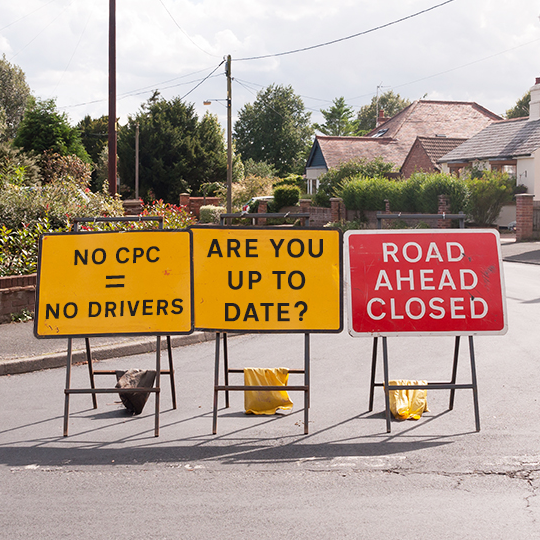 There are two types of CPC: Initial (aimed at new drivers) and Periodic Training. Use the below form to establish which one you’ll need. What type of CPC do you need? Module 2: Case Studies – click here to book Module 2 direct with the DVSA. Module 4: Vehicle Checks Practical Test – you would normally book this with your training provider who will be able to supply the vehicle for the test. A list of our prices for Periodic Training can be found on our Training page. The DVSA module 2 theory fee is £23(as of June 2018) (click here to book) and the fee for the module 4 test is £55(as of June 2018) (click here to book). For module 4 you’ll either need to provide your own vehicle or hire one. Your practical training company will normally offer a bundle which includes some training for the module 4 test, the fee for the test, and hire of the vehicle. If you get quoted more than £250 for this then you should probably shop around. After you pass your theory, practical and CPC – you are ready to hit the road! Check out some of the jobs we have for you by visiting our job board (click here). Or you can find out more about what it means to drive for Backline by visiting our driver area (click here).